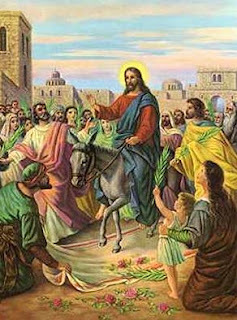 My earliest memories of Palm Sunday involve my recently departed mom.. she had us in church every Sunday morning at All Saints Episcopal Church on Staten Island, NY. On Palm Sunday each of us received a branch of palms that we waved around.. the palms seemed to add to the joy of the day. Easter Sunday had a different feel to it.. a bit more formal.. I usually got a new suit or sports jacket for Easter. During my fundamentalist years Palm Sunday and Easter were really special.. the songs we sang blended in so well with the season. I have vivid memories of singing songs of resurrection - The Easter Song recorded by The 2nd Chapter of Acts was especially memorable.. listened to it again this week on YouTube.. a lot of joy in that song. I guess I am always amazed at the picture that is painted in the gospel accounts of Jesus' last week on earth. The week began with a palm branch laden journey into the city of Jerusalem where later that week Jesus would be crucified.. the week began with praiseful exclamations of Hosanna and ended with shouts of crucification. I recently heard someone say that Jesus' early morning trial was a reflection of the condition of humanity - in a sense it was actuality humanity, rather than Christ, that was on trial that dark morning. Of course the trial and subsequent crucification of Christ is not the end of the story. After three days and two evenings in a tomb Jesus was raised from the dead, appeared to many of his followers and now ever lives at the right hand of the Father. He, who in utter agony on the cross asked God to forgive His tormentors, today offers that same forgiveness to us. What memories do you have of Palm Sunday and Easter? What thoughts come to mind? Being raised in a Baptist Church from a very little girl, I too remember the palm branches, and singing joyful songs. We would act out the story in Sunday School, laying material and palm branches on the floor and pretending we were the worshipers on the way. As an adult, and being in ministry so many years, my heart continually was amazed year after year at listening to my husband share the Easter series each year. I love this time of year, and I love that my sins are forgiven and someday, I will praise my Lord in person! Thanks for a good Palm Sunday post, Bob. After doing it again this morning, I am always touched, no, stabbed to the heart, when we participate in the reading of the Passion of the Lord. It's the crowd's job to say "we want Barabbas!" and "Crucify Him!" and "Let God save Him!" and saying it out loud, putting some emotion into it, makes me scuffle my feet and think of how I fail Him, no matter how much of His Grace He pours on me. Good way to start Holy Week. I am astonished at how many churches do not follow the timeline of the Passion, Death and Resurrection of the Lord in at least the week leading up to Easter. I listen to a non-denom church radio broadcast on Sundays when I get dressed for church, and they were dealing with some other message completely. Not wrong, but insensitive to people's need to get mindful, to get ready, to review their lives, before the Joy of the Resurrection. I was raised Roman Catholic, went to Catholic school, and served at mass regularly. Holy week had days filled with full-day or almost full-day services, Good Friday especially, I think. It was always a chore to serve because you'd serve for a couple hours at a time. There was also a service where we did the stations of the cross. Nowadays, we attend an Episcopal church. The services are more reasonable in length. Holy Palm Sunday is just the beginning of Jesus trial and us to stay with him. Happiness and joy Jesus appreciated has fulfilled with hopes. All Christians around the globe expect the survival action for their severe sins against God. Jesus is the answer. Following the Palm Sunday, Holy Thursday, Good Friday and the Resurrection day, Easter. Christians are expected not to go too far. This is the only week beside their many ones. So it's time to pray very hard, in order not to get into temptations, not eat too much, and most of all, is to turn their hearts completely to the Lord Jesus Christ and pray for his forgiveness. Especially on Good Friday, there will be no bells to ring, no happiness or having fun- only just to really put ourselves into sadness moment we've ever had in our life. Just only for this day. And most of all, no meats to eat. Every time I sin against God I feel alone. Each day I pray I feel secured. Every single moment I see the cross reminds me of my Lord, Jesus Christ. I'm just not as good as a Christian. I am an bad evil person who keeps on looking someone's life without seeing mine. In this time, Palm Sunday has totally made me changed. I just now realize that being a christian is a good and a right path. Without God, I am nothing. This holy week is just the reminder of my life I've ever had beside my many ones. Taxing Sugar? What a Joke! At least we have the Jayhawks! Who Needs Snail-Mail on Saturday?